Markets only go up, right? Well, equity markets, in any case. February proved that perhaps this isn’t that case. However, whilst equity cash and vol markets were rattled, the effects on FX more broadly, were relatively tepid. The USD did strengthen, but only modestly, and since then most of those gains have reversed. 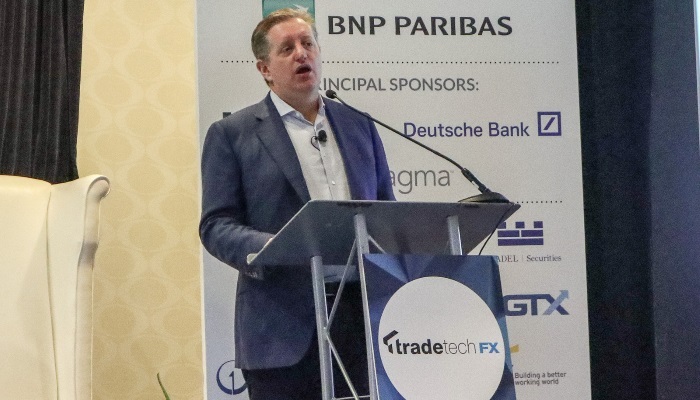 Against that backdrop, earlier this week, the annual TradeTech FX USA conference took place, bringing together FX professionals both from the sell side and buy side, as well as a number of different vendors. In this short note, I’ll give my takeaways from the discussions at the event. There were several panels and presentations on the general market environment. Perhaps unsurprisingly, most were bearish on USD. Whilst interest rate differentials have been a reasonable basis for trading FX, in recent months there has been a breakdown of this relationship, with UST yields rising at a time when USD has also weakened. George Saravelos (DB) discussed how flows were becoming more important and also how historically there have been cycles in the dollar lasting between 8-10 years. He noted that turns have usually occurred off the back of political events, citing most recently the election of Trump and Macron as a trigger. Furthermore, he expected flows were likely to be favourable for a move higher in EUR/USD, with investors largely underweight Eurozone assets, whilst US fixed income was perceived expensive. An important point of course is that ultimately, that even a small shift in flows could have an impact. The idea of the twin deficit as a break on the USD was another reason cited by multiple market participants as a reason to sell the USD. I was also on a panel discussing the relative policy stance of the Fed and ECB, moderated by Michael Melvin. We were largely in agreement on the USD weakening. Of course, when everyone seems to be in agreement, it can be somewhat unnerving. After all, just over a year ago, the forecasts were all aggressively for EUR/USD downside! The risks are of course, that inflation picks up forcing the Fed’s hand to hike more than is priced in. At this stage, I think that’s a low risk. There was also an interesting presentation from Alessio de Longis (Oppenheimer), discussing the notion that USD, was the funding currency for global growth. Hence, strong global growth should lead to increased USD funding and underperformance in the USD. He suggested that whilst rate differentials could be used to understand short term FX moves historically, they were not as successful at gauging the overall trend. Several years ago, when going to FX conferences, there was usually a discussion on cryptocurrencies, which was usually pretty quiet and not well attended. Times do seem to have changed and there does to appear to be a lot more interest. There was a presentation by Bobby Cho from Cumberland Mining, a major liquidity provider for cryptocurrencies, where he explained aspects of the market, noting how bitcoin was now less dominant compromising around 35% of market cap, compared with well over 90% several years ago. Both bitcoin and ethereum had become gateways to other cryptocurrencies. Indeed, many transactions simply go between various cryptocurrencies, and don’t always involve a fiat currency such as USD. It was likely there would be more use cases and market segmentation based on use cases. There were obviously many questions, such as will ethereum eclipse bitcoin in terms of market value (or indeed, could other cryptocurrencies such as EOS or NEO become the winners)? I don’t claim to have an answer to that! There was also a panel discussing whether cryptocurrencies should be part of an institutional portfolio? A poll of the audience suggested no. However, as the panelists noted there is obviously a difference between cryptocurrencies as a short term trading proposition versus a long term investment. With MiFID II bringing to the fore the idea of best execution, it was not surprising that TCA (transaction cost analysis) was a major talking point, with several panels and interviews on the subject. As the name suggest transaction cost analysis involves trying to find out the cost of execution. Whilst understanding the spread is important, other metrics are just as key, such as understanding market impact. Kevin McPartland (Greenwich Associates) interviewed Isaac Chang (AQR) discussing what were important elements of best execution. Chang noted how there could be different priorities, between execution traders and portfolio managers. Whilst it can be the case the execution traders might have incentives to execute quickly, it was important to look at the full cost of a trade, which might require patience in execution. One theme that came up during many of the panels/discussions was the difference between FX and other asset classes. FX mixes bilateral transactions with an anonymous order book, whereas an asset class such as futures, was more traded around anonymous order books and fixed income tended to be more bilateral. In effect, each person sees a different FX market, given credit considerations. Furthermore, the dataset you will see is only a snapshot of the market and this same comment was repeated by many different speakers at the event. I found the discussions around TCA particularly interesting, given that I am currently working on a TCA library for FX (& crypto) all written in Python. I am hoping to open source some of it, if I can find sufficient interest and sponsors for it. The idea is that this generic framework will provide an exciting platform for the community to create their own metrics and share them. For funds wishing to sponsor it, it will provide them an interesting way to find new ways metrics of doing TCA. For FX data companies, it will also provide another avenue to distribute their dataset. So if you would like to see an early demo of the software and would be interested in sponsoring it, please let me know! The keynote speaker was Steve Eisman (photo above), the portfolio manager who was portrayed in the Big Short movie, by Steve Carell. He discussed the financial crisis, and in particular, how he spotted early on the problems associated with the subprime mortgage market. He thought one of the harbingers that the party was over, was in 2006 when a large mortgage company was sold out to a Wachovia. Another sign was in the summer of that year, when loans from that spring started to go bad. He noted the incentives to drive the volume of loans higher, regardless of whether these loans could be paid up. As well as going through the financial crisis in a lot of detail, he also discussed the subsequent regulations which he felt made the financial system safe, with leverage much lower. There was now however a move to go the other way, and a move o reduce regulations. He felt that at present credit quality is good and there is no data indicating an underlying problem. He also didn’t see the current size of the deficit as a problem, noting how similar arguments have been made for 30 years. The FX market is very much evolving and that’s certainly that’s what I’ve seen in terms of going to TradeTech FX events over the years. It has been through a difficult few years, with the various benchmark scandals, as well as fundamental changes, with the advent of more technology. However, it does seem that things are picking up and opportunities ahead.